Approx. 10.25" (26 cm) high x 10" (25.4 cm) diameter at its largest. No bad odours. No pests. No worries. Now available in Canada! The Urban Composter City bokashi bin is the quick and easy way to create compost from your kitchen waste. Stylish, clean and effective, the Urban Composter City is a kitchen countertop composting system that turns your unwanted peels, food scraps and leftovers into nutrient-rich fertilizer for your garden. This revolutionary compost container doesn’t just hold your kitchen scraps en-route to the compost heap; it actually starts the composting process right in your kitchen without any bad smells. And you can compost not only fruits and vegetables, but also meat, fish, dairy, eggs, and fats! The Urban Composter City is a stylish and compact bokashi solution for smaller homes and apartments—it’s a mighty bokashi bucket in compact form, holding a very respectable 8 litres of kitchen scraps. The Urban Composter Family looks great on the countertop in any kitchen—holding more than 22 litres of kitchen scraps, it is ideal for families or any household that produces a lot of organic waste.. 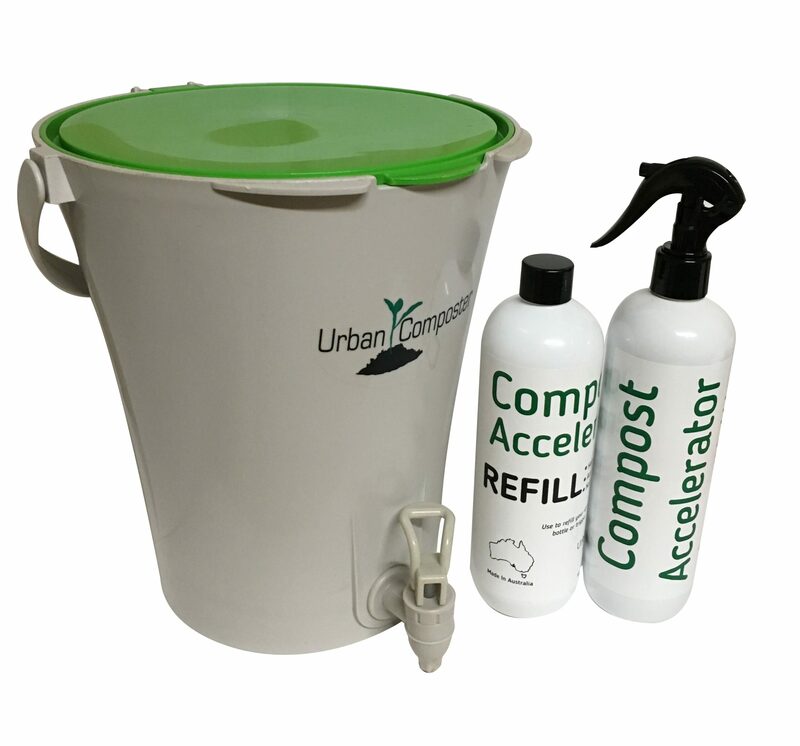 The Urban Composter City is available for purchase separately or as a kit with the Compost Accelerator and masher. 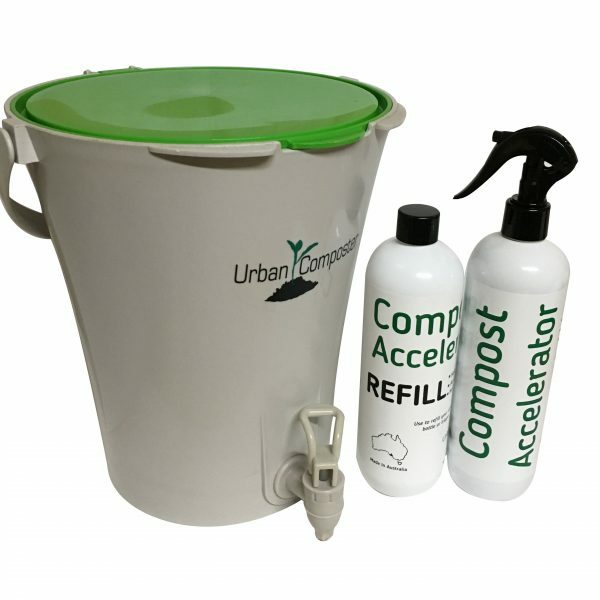 Made for use with the specially formulated bokashi Compost Accelerator spray, the Urban Composter City is airtight, convenient and easy to use. The bucket is made from recycled plastic. The Urban Composter City comes with a tap to drain the bokashi liquid, which is rich in nutrients and makes an amazing fertilizer for your garden and houseplants (it’s also great for septic systems!). NOTE: due to the size and weight of this product, a flat shipping rate of $30 applies. We offer free local pickup within the Greater Toronto Area. Please contact us at info@ahimsaeco.com for further details.